A smoky sweetness emanates from the peach and cherry chutney I’m tasting. The smokiness is subtle, the cherry flavor bold, fresh and a little tart—not too sweet and not at all salty. Celeste Croxton-Tate of Lyndigo Spice says it took her about six months to figure out how to get the smoky flavor into the cherries without the bitterness she found in smoked spices or the strong flavor in liquid smoke. When Celeste was about 11 or 12, she began cooking recipes she found in her favorite magazine, Elle. Her mother loved her wild-rice-stuffed Cornish game hens so much she asked Celeste to make them for dinner every Sunday night for several months. Celeste continued to cook into her adult years. “My first marriage wasn’t great so I would cook,” she says, but it wasn’t until 2006 that at the urging of friends, she started a catering business. Unfortunately, the recession hit, and soon her would-be clients were having potluck suppers instead of catered dinners. Though Celeste quit the catering business, her former clients continued to ask where they could buy the pineapple chutney she served with her Jamaican jerk chicken. Finally, in 2014, Celeste began selling her pineapple chutney commercially. Celeste’s husband loves barbecue but his hypertension requires a lower-sodium diet than most barbecue dishes allow, so Celeste created a low-sodium paprika-based spice rub. “We put it on everything,” she says, describing a family dinner of steak tips marinated in a tablespoon of the rub mixed with Guinness stout. She and her husband even gave their wedding guests jars of the rub, labeled “We Got Hitched,” with a recipe for baby back ribs when they married in August 2015. She roasts chickpeas with the spice rub (check her website for the recipe) and often uses them to offer samples of the rub at farmers markets or food events. At last year’s Vegan Fest, Celeste says, “My girlfriend was with me, and she was eating some popcorn.” That gave Celeste an idea, and when she ran out of chickpeas, she mixed popcorn with the spice rub and handed out “popcorn shots,” which, she says, turned out to be a big hit, especially with the college students. “Most of my recipes come out of me not wanting to waste food,” Celeste says. Her favorite day is Tuesday, the day before garbage day, when she tries to use up any leftover food. That’s how her Ginger Blueberry Fruit Spread was born, with fresh ginger left over from making the Pineapple Chutney. As she creates each recipe, Celeste uses whatever she has on hand to spice it up. 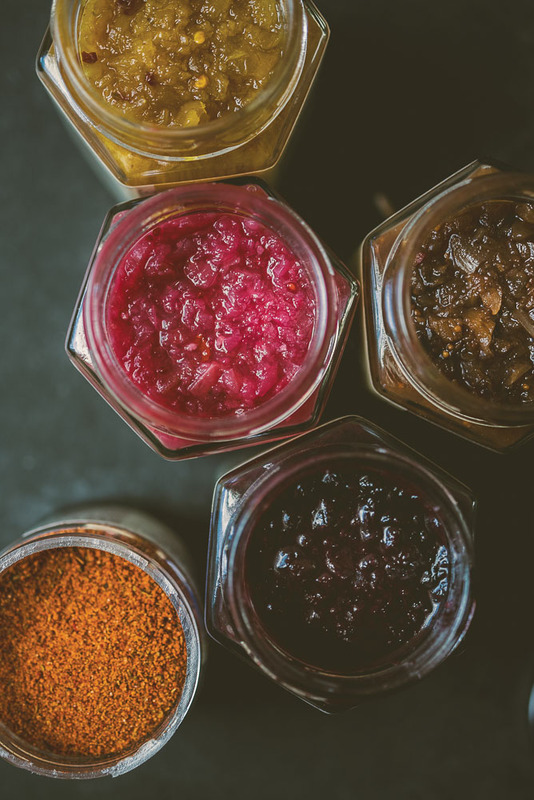 When each vendor was asked to bring a strawberry product to a farmers market in June, Celeste created a new chutney flavor containing strawberries, shallots and balsamic vinegar. When her husband asked her, “What’s the Lyndigo spin? What’s the Celeste spin?” She thought a minute. “At the time, I was on the grill,” she says. “So, I said, ‘I’m going to smoke those strawberries.’” She used the juice that was created when smoking the strawberries to make a strawberry barbecue sauce. “Behind most of my recipes, there’s a story,” Celeste says. “When I get stressed from work or everyday life, I cook.” When her husband and her sons, now ages 22 and 24, are home for dinner, they want to know if she had a stressful day. They know from experience that if she’s stress-cooking, it’s going to be good. Celeste and her Lyndigo Spice products will be at Boston Public Market December 5–18. New for the holiday season are her products in 3.4–ounce jars, specially sized to make it through airport security. You can also find them at several Whole Foods locations and online. This story appeared in the Winter 2017 issue.